After a one-on-one meeting and an expanded bilateral working session with senior aides from the United States and North Korea in Singapore Monday, President Donald Trump and Chairman Kim Jong Un officially established a new relationship under a joint agreement of the eventual denuclearization of the regime. "The United States and the DPRK commit to hold follow-on negotiations, led by the U.S. Secretary of State, Mike Pompeo, and a relevant high-level DPRK official, at the earliest possible date, to implement the outcomes of the U.S.–DPRK summit," the statement continues. 1. 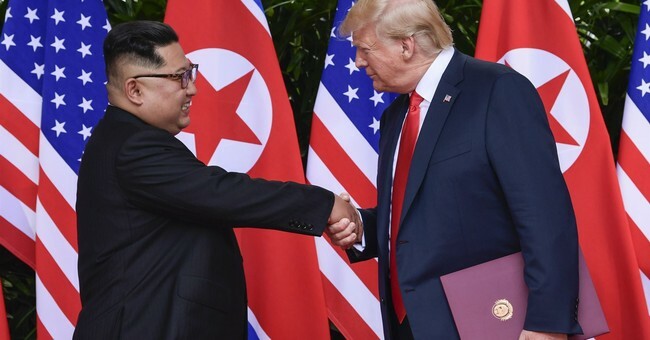 The United States and the DPRK commit to establish new U.S.–DPRK relations in accordance with the desire of the peoples of the two countries for peace and prosperity. Kim expressed gratitude for the historic meeting. "Today we had a historic meeting and decided to leave the past behind and we are about to make a historic change," Kim said. "I want to express my gratitude to President Trump to make this meeting happen." President Trump confirmed he plans to meet with Kim "many times" in the future and held a press conference to close out the summit. He also said the U.S. will stop military exercises with South Korea and said eventually the U.S. could pull troops out of the region completely. "Chairman Kim and I just signed a joint statement in which he reaffirmed his unwavering commitment to complete denuclearization of the Korean peninsula," Trump said. "As history has proven over and over again, adversaries can indeed become friends...We're prepared to start a new history, and we're ready to write a new chapter between our nations." “Anyone can make war, but only the most courageous can make peace," Trump continued, stressing he has given up nothing at this point in negotiations. "We will be stopping the war games, which will save us a tremendous amount of money, unless and until we see the future negotiation is not going along like it should." Until denuclearization is complete, economic sanctions on North Korea will remain in place. President Trump is on his way back to the United States.